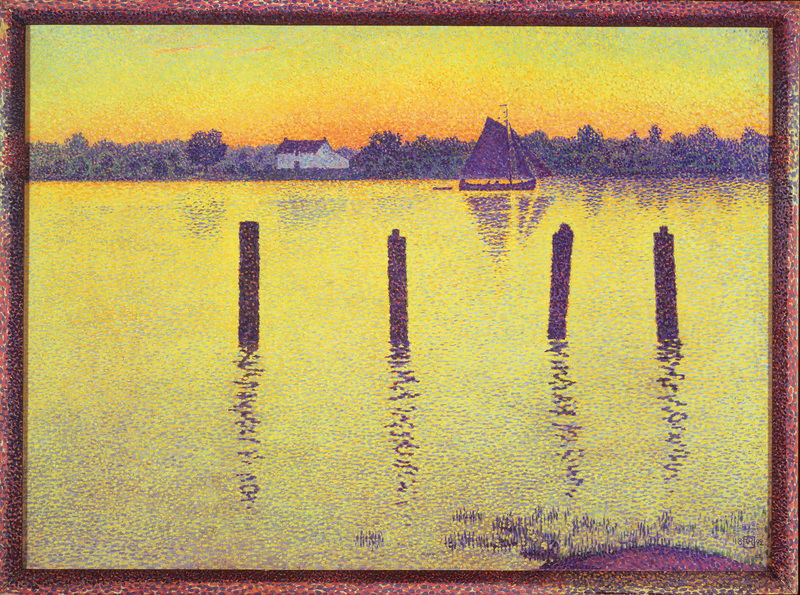 The intense, complementary hues of yellow and purple create a magical atmosphere in this painting by van Rysselberghe. The mood is quiet, yet joyful, as we see the sun setting on a picturesque view of the Scheldt while a boat quietly sails past. The anchor poles and their relflection in the water provide a gentle rhythm to the composition, urging us to reflect on the day’s end and welcome nightfall. 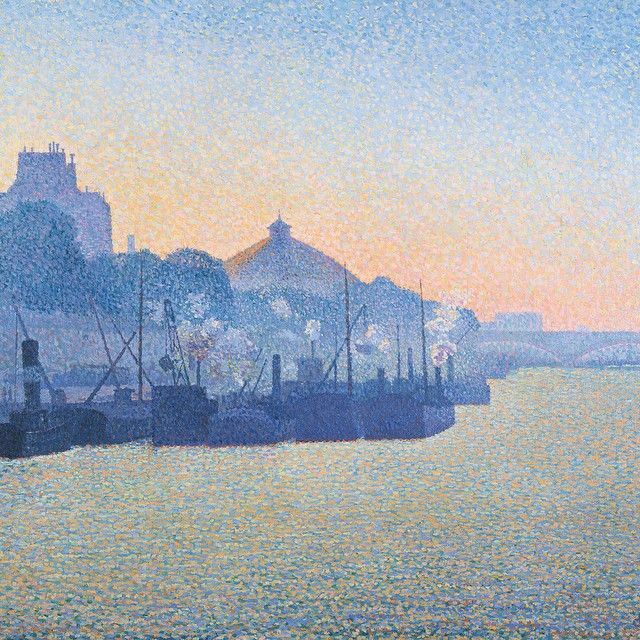 Dubois-Pillet’s The Seine at Paris depicts that intangible, quiet moment amidst city chaos anyone who’s ever lived in an urban metropolis has sought at one point or another. Here, he paints Paris on the verge of another day, before the hustle and bustle begin. The sunlight is peeking over the buildings as the boats on the Seine await their captains, their engines slowing coming to life emitting puffs of steam in the chilly morning air. 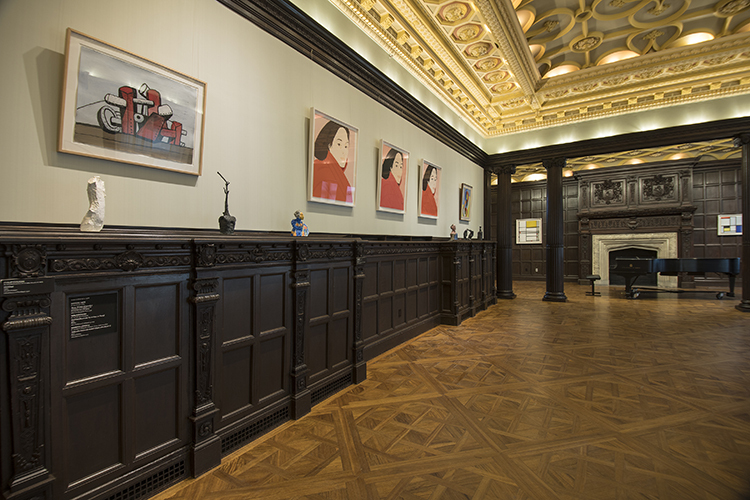 It allows a moment of contemplative meditation as the dreams of night fade and the reality of day emerges. 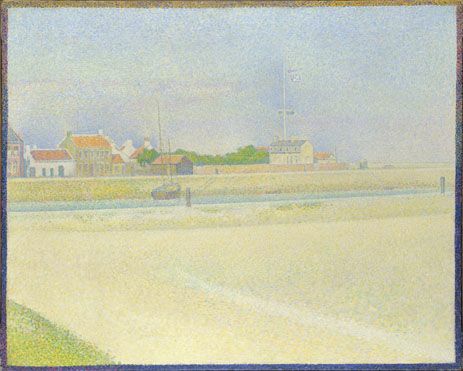 Seurat’s Channel of Gravelines, Grand-Fort Philippe proves that you don’t have to depict the morning, evening, or night to create a work that encourages the viewer to take a moment and let time stand still. In this painting, Seurat depicts accurately the landscape of Gravelines on the Normandy coast but removes all traces of human life in favor of a powerfully silent composition that is both peaceful and unsettling. The painting’s long vista and high horizon line encourage a meandering glance across the surface while the muted blues and yellows and Seurat’s pointillist technique softens and obscures any semblance of reality. It took Angrand about three years to complete this drawing. THREE. YEARS. And it’s perfect. 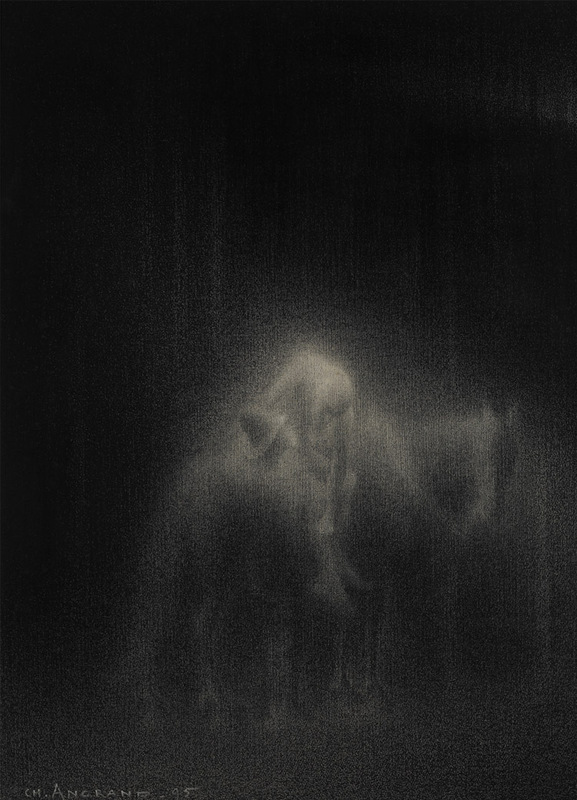 The figures of the samaritan, the man he’s hoisting onto the horse, and the horse seem to materialize from out of the darkness. The more you look and meditate on the picture, the more intricate and beautiful the details emerge. 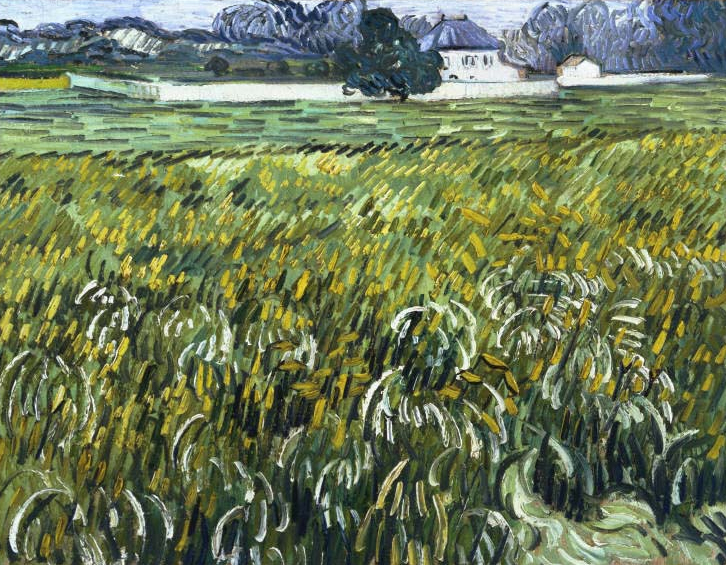 Angrand began as a painter but found his greatest artistic expression in Conté crayon and soon quit painting altogether to create masterworks such as this one. Is there anything more peaceful than observing a moonlit seashore in Normandy as boats bob gently up and down in the harbor while the world around you sleeps? I don’t think so. Luce was brilliant at utilizing deep blues and purples to evoke a quiet dreaminess in this and other works on view in the exhibition. 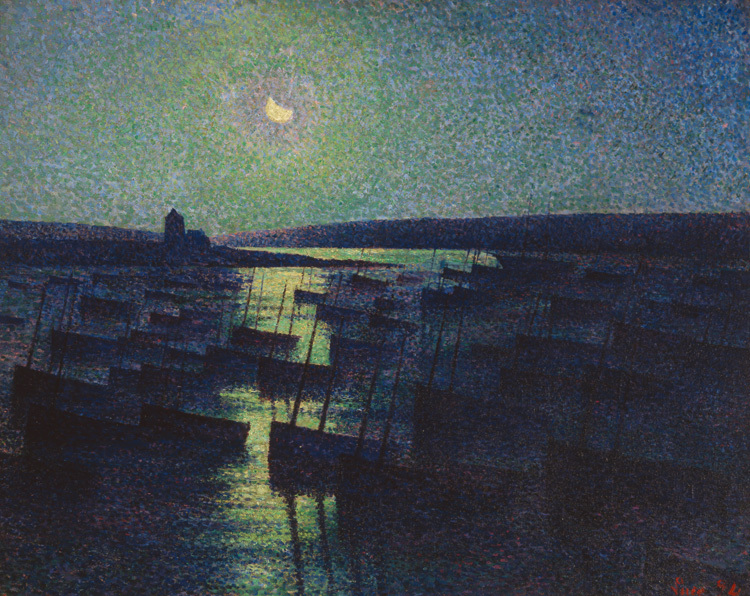 Critic Gustave Geffroy praised this painting when it was exhibited in 1894 in Paris, writing “It is Camaret at night, the boats sleeping in the atmosphere of purple velvet, on the mysterious, phosphorescent sea…” I couldn’t have said it better myself. 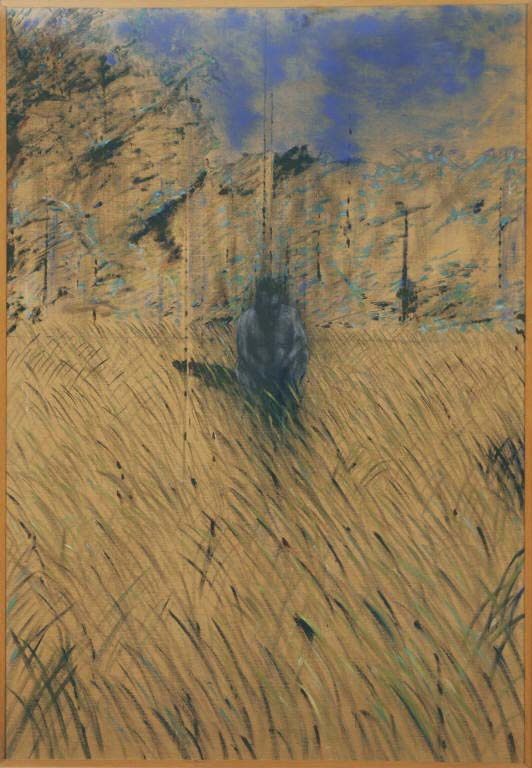 Neo-Impressionism and the Dream of Realities: Painting, Poetry, Music is on view through January 11, 2015.